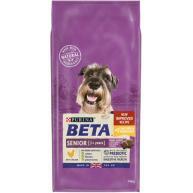 BETA Sensitive Adult Dog Food is sure to keep tails wagging! We know that some dogs are more sensitive to food than others, but that does not have to stop your dog from living an active and curious life. 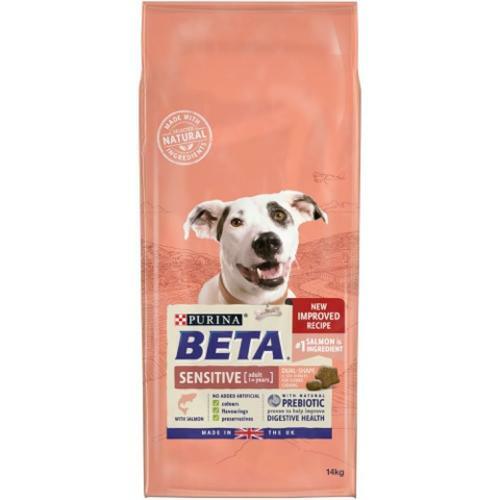 That is why our PURINA BETA tailored nutrition Sensitive food is specially formulated with salmon, a high quality protein which helps to support good digestion, as well as with Omega 3&6 fatty acids that helps reduce possible discomfort in your dog's sensitive skin. 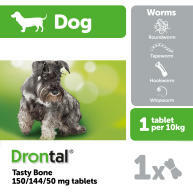 It is also specially formulated with selected natural ingredients and a natural prebiotic to help support digestive health that help your sensitive dog get the most out of his day. And all this without including any added artificial colours, flavours or preservatives. Feeding Guide: These amounts are guidelines only. 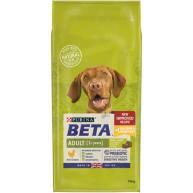 Adjust the daily amounts according to your dog's activity level, physical condition and individual needs. Clean, fresh water should be available at all times. To monitor your dog's health, consult a veterinary surgeon regularly. 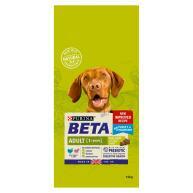 Introduce PURINA BETA gradually over 7 days.